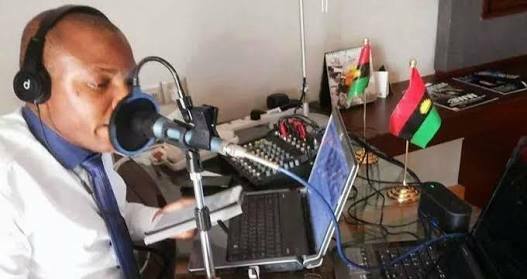 Radio Biafra to begin broadcast in America – Royal Times of Nigeria. Radio Biafra is set to begin broadcast in America from Sunday, The Cable reports. Director of the station, Nnamdi Kanu, is currently in custody of the Department of State Services (DSS). This is development was contained in a statement issued on Friday by Leonard Anemene, a leader of the organisation. He said; “On the 12th of January 2017, the leadership of IPOB in unison with the leader, deputy leader and the Directorate of State (DOS), decided to expand the broadcasting services of the Biafran struggle through the creation of a new broadcasting service in the Americas,”. “So, a live broadcast of Radio Biafra International (RBi) from the Americas has been imminent for a very long time now but was delayed due to logistic bottlenecks. Anemene also dismissed the claim by the federal government that it had jammed the station. The group said in a statement; “NBC lied to their master. Radio Biafra is live in Biafra land. They cannot even ban our local station, do they even know we also transmit via satellite and online as well,”. Anemene failed to reveal the broadcast location of the station.